Greg Hunter is a highly respected veteran news reporter who has worked for many major news networks in the past. Greg continues to make his voice heard as the producer and creator of USAWatchdog.com. The site's slogan is "analyzing the news to give you a clear picture of what's really going on". Unlike those in the corporate media propaganda circles, Greg has the courage to thoroughly address the most critical issues that most of his peers are afraid to even mention. 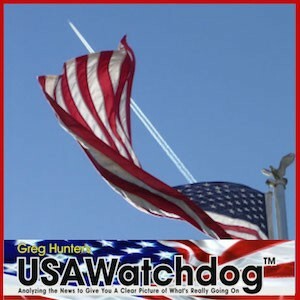 In the article and video below USAWatchdog helps to shine the light on the extremely dire issue of global climate engineering and the planetary devastation it is causing. Dane Wigington runs a website dedicated to exposing and explaining to the public the dangers of climate engineering, also known as “chemtrails”. This is not some sort of conspiracy theory but hard science, also known as “solar radiation management” or “geoengineering.” What does Wigington say to the disbeliever? “We have film footage of these tankers spraying at altitude, up close nozzles visible. We have close up photographs of these nozzles right behind the engines. At that point, the argument ends. We have footage of the crime happening. There is no argument or dispute–it is absolutely going on. We have President Obama going on the record saying that climate change is the greatest national security threat of all. . . . Do you think that they would ask our permission before they do this? That is a very naïve thought,” says Wigington. Wigington has spent his retirement money warning the public about what is going on with climate engineering. He has zero monetization or advertising on his website GeoEngineeringWatch.org. He says he does not want to taint the site or the scientific data on it. If you would like to see how some state legislatures, such as Rhode Island, are taking on this issue, click here. You can also find a tremendous amount of scientific proof and information on GeoEngineeringWatch.org. If you are searching the internet to do your own research, Wigington says do not use the search term “chemtrails” because you will get conspiracy disinformation and not pure scientific information. Wigington suggests you use scientific terms such as “geoengineering”, “climate engineering” or “solar radiation management”.